Teaching an Old Dog New Tricks: 42. Watch The Jersey Boys! 42. 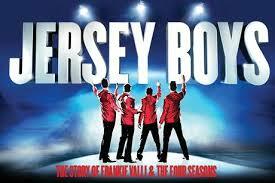 Watch The Jersey Boys! This is something Mum, Sharon and I wanted to do whilst in New York last September, but we couldn't get tickets for the Broadway show. However, Sharon found a good deal on a theatre break in London, so last weekend we all went to finally see The Jersey Boys. What a great show with fascinating story and all the famous hits from Franki Valli & The Four Seasons to sing along too!